The Amish buggy rear-view. Next Tuesday will be traveling to Lancaster County for a week’s visit. Expect more views like this. Though I am ready for spring here near Illinois Amish country, I love this shot! “an aaaahhhh inspiring experience” at the end of a very long and stressful day. thank you so much……. Beautiful shot! Interesting diagonal composition, inspiring light and colors. I can smell the cold, crisp air all the way down here in Louisiana. And thanks for posting the photo this large (more often, please!). 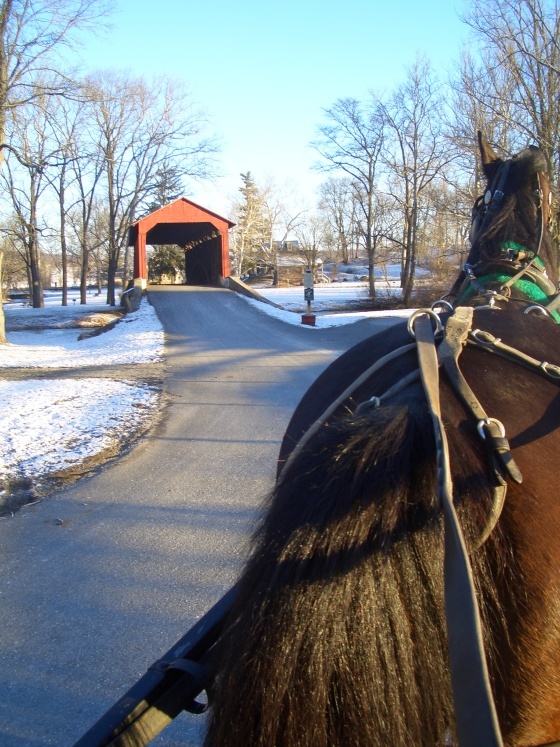 oooohhhhhh a covered bridge, lovely picture…..
Glad you liked it! And Brian you’re giving me too much credit, but thank you! It’s a good guess, but not the one–Cocalico is a very scenic spot as well. Will give you another shot though, if you want it! Erik, thanks for a wonderful pause in my day . . . a feel the gentle sway and hear the clip/clop!